Steem Just hit $0.50 levels | Will this hold?? 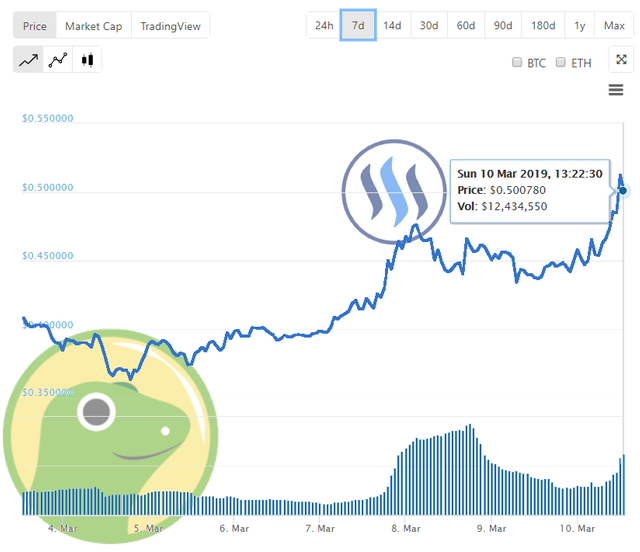 Over the past 24 hours, Steem has gained a double-digit growth as it shoots up to $0.50, a level that has only seen since November last year!! From our data, even though the top traded place of Steem is still Upbit, Korean Exchanges no longer hold the top 2 spots as the Trading volume of Steem/BTC in Binance overtakes that of Bithumb. The recent listing of Steem on Huobi also sees a near $1 Million Dollars in Daily Volume. Will $0.50 be the next level where Steem price will hold? Or is it a rally that will bring Steem back to "normal" price. Are you selling your Steem? Share your thoughts in the comments below! Please consider voting for our Witness Campaign! It's good to see the price of Steem rising... I have no idea whether it will keep going up or not, but in long term, it should worth more than this for sure. Why? I dunno, I just feel like this. I live off my steem rewards and steem-related money. I sell some steem weekly regardless of price so I can eat etc. I have been doing this since Dec 2017. I live in SE Asia where this money supports a pleasant and comfortable life of poverty. But any increase will make my life so much easier. I do not sell until Tuesday or Wednesday each week, so I hope the price does hold or goes up more by then. I think we are getting recognition due to the new exchange listings and with the new attention to the growing list of dapps. I feel like quite a number of the dapps are successful and will be more successful with each day that passes by. Then we got this steemengine token thing going. I do not understand it, but I own various tokens now! The people who do understand crypto seem to be very happy with this news, so I think this is also a plus. And we finally have action on Twitter in the last months thanks to @nathanmars initiative, and more steemers tweeting good content. I think this will keep improving too. Two months ago I had less than 400 steeming tweeps on my list, now I have close to 600. Twitter action can only get better from here. I feel like steem is undervalued and that a "normal" price should be much higher than it is. The steem blockchain is fast, reliable, easy to get on, inexpensive for developers, and has a lot of unused capacity. Soon more big people will see this and get onboard. Same here. Steem is a source of income and we just do our best to get by. interesting insights! And it's amazing to see that people such you yourself can support your living expense off Steem alone! I am not alone, but I am in the vanguard. It's not all about holding on for a certain price for many of us in the third world. Few in the west pay $85 usd a month for rent though. And the liquid amount of your comment upvote will buy me 3 days of drinking water, so thank you very much! I will not sell my Steem yet. I have it all on SteemPower and I'm not selling until it is at least 10 USD or more. I was checking the price chart on your site, it is exciting and fun to see the price rise. I hope it can continue moving up but I also hope I have time to invest some more. I don't think this will hold. There is going to be a correction. But not selling because I'm not a trader. I honestly cannot see it holding at this level. Realistically, Steemit Inc hasn't done much to bring the value up. When SMT's launch, we'll see a new strong support level. For now, unless Bitcoin goes up and drags us with it, this will be short lived even if Steem is a great coin that is worth more. Always be dubious of unexpected growth in crypto. I don’t sell steem, I hodl! unless if there’s urgent need that demand selling little. 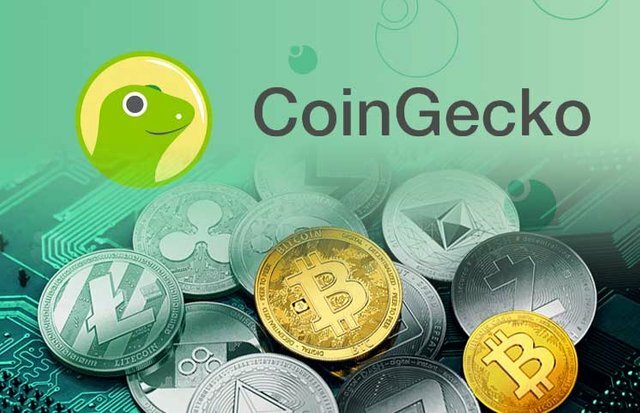 Thanks @coingecko for bringing crypto news to us! I bought all the way down and now I'm earning more every week so happy out. This is a long game for me so I won't be selling anything unless prices go a lot higher. Like a lot higher. I want to be sitting here in 3 years with 50k STEEM and each of them worth $100. But until then prices growing steadily is far better than the crazy jumps we say before. While it's down here people are more focused on the development than the money which is good. Maybe i will sell 10% of my Steem for Bitcoin and then rebuy latter for a much cheaper price. I am not only holding but plan to continue buying every month. This month has caught me by surprised and have unfortunately not invested yet but I will as part of my Dollar Cost Averaging strategy! I am selling half of my Steem and others would be kept. So it would be a fifty fifty chance of what happens.